If you have any questions or want to enquire about dates, use our form to contact Judy Thompson or see their website for more information. 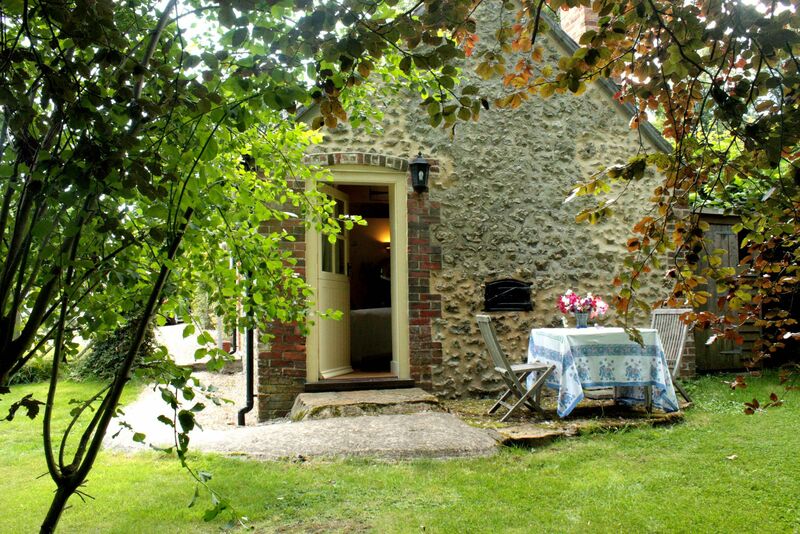 Snug in a stream-tickled hamlet, deep in Hardy country, this B&B is as pretty as a painting and wonderfully peaceful. Judy is charming and friendly – this is a happy place, a real country home, a no-rules B&B.The 17th-century farmhouse opposite is where you breakfast: Judy, ex Prue Leith, serves a neighbour’s eggs, a friend’s sausages and good coffee in an eclectically furnished room with bucolic views to garden, meadows and hills.Walk from the door or head to the Jurassic Coast for more demanding hikes, explore Bridport’s vibrant Saturday market or beautiful Sherborne Abbey, discover bronze age forts. Judy is happy to give you a lift to and from the nearby pub. Towels for drying and protection covers for chairs etc. Large garden - almost secure except for stream, which an adventurous young dog could jump across. Singles £60-£70. Stays of 2+nights: £80-£90. We had such a lovely stay with our greyhound and felt very welcome. Brilliant location and superb breakfast. Loads of local walks and pubs, close enough to the coast to spend the day. What a wonderful discovery. 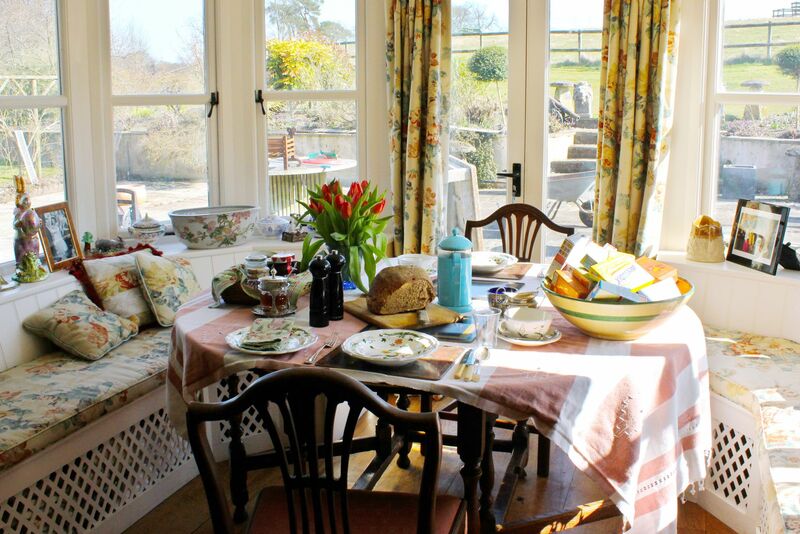 Everything you'd want from a Country Bed & Breakfast. 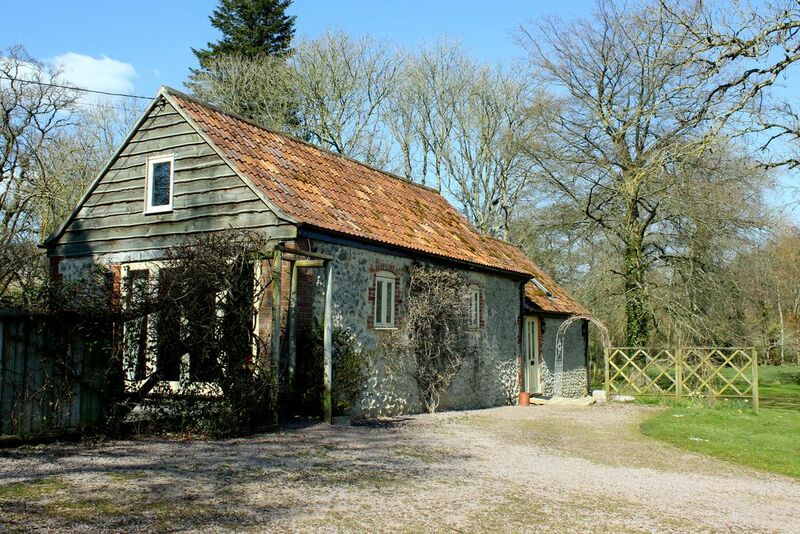 It's up there with the best we've stayed in - and that includes dozens recommended by Sawdays. It was peaceful, scenic, rural and we were made to feel welcome from the moment we met Judy to the time we had to pack our bags and come home. Everything you read about the breakfast is true. Just fabulous. The room we stayed in was spotless, cosy and full of creative and welcome touches. The door opened out onto a huge green garden where we relaxed in garden chairs at the end of a busy day in Bridport. We loved it. We and our dogs had a fantastic stay at the Old Forge, Judy and Tony were charming and the breakfast was fantastic. I would definitely recommend the Old Forge. This may be THE best B&B we've stayed in, the room was lovely with a big secure garden for the dog to enjoy . Beautiful village with good places to eat and drink near by. Mr and Mrs Thompson were very welcoming and put us at ease. Breakfast was perfect. We would love to return another time. Highly recommended. This place is pretty much as good as B&Bs get. Judy is a great host, relaxed and entertaining, clearly used to having people around and making them feel at ease. The breakfast was absolutely superb. The room was spotless, and had everything you could ever need. And not only that, it was separate from the main house so you had privacy too. In short, if every B&B was like this, hotels wouldn't exist. Staying here really made the weekend for us, and we'd do it again in a shot. Judy was a delightful host and we appreciated the thoughtful extra details that made our stay enjoyable - an extremely comfortable bed with ample pillows, quilts and quality linen, plentiful OS maps, a wool rug to wrap up in, in the deck chair in the quiet garden, sweet peas, a jug of fresh milk waiting on the doorstep in the morning. Local pub was extremely good and all this followed by one of the best B&B breakfasts we have ever had. We will definitely come back as there is so much to do in this part of Dorset. We were made to feel very welcome on arrival with our dog after a long day of walking on the Macmillan way. Very comfortable room in delightful corner of Dorset. Lovely relaxed breakfast with fresh fruit and local produce. Our host was kindness itself - driving us to the local (very good) pub for food and collecting us again. Much welcomed by tired legs. Head out straight from the door or get in the car and drive 30 minutes to the coast to tackle Dorset coast's highest peak, Golden Cap - you'll be rewarded with incredible sea views at the top. If history is more your bag, plan a gentle hike to the Bronze Age Forts at Maiden Castle or Eggardon Hill. Discover hidden pubs and wander past thatched cottages as you explore the countryside that poet Thomas Hardy loved so much. Walk to the highest point on Dorset coast - Golden Cap with stunning views. Experience the unique Swannery in Abbotsbury where 100s of swans nest and rear their young. Bridport Saturday market a must for the arty and for those just searching for a treasure to take home. Walk the bronze age forts - Maiden Castle, Eggardon Hill and Pilsden Pen. Visit Sherborne Abbey and the town packed with individual shops. Follow Lower Wraxall on Facebook for up to date news. Lovely Judy is a light-hearted, humorous lady who loves all things rural – especially her home, which she can’t imagine without her beloved dog. 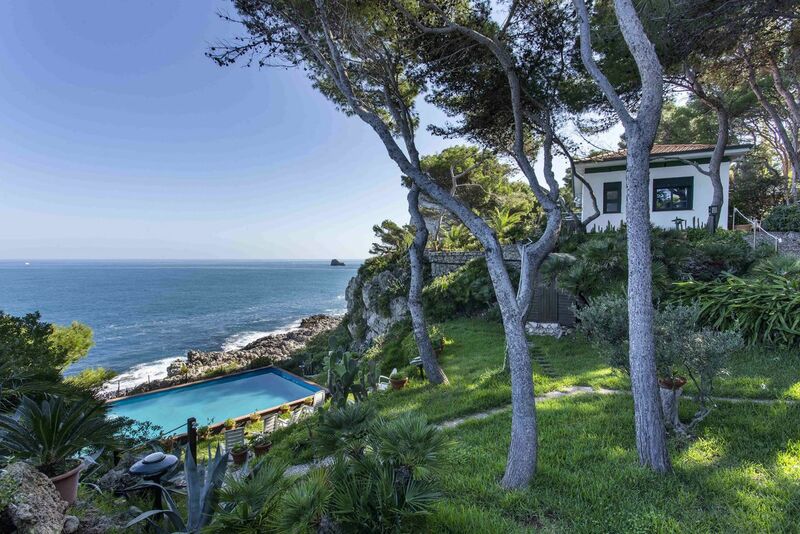 Her homemade cakes are legendary and when she's not cooking you'll find her painting pretty watercolours, gardening or taking a dip in the summer sea.